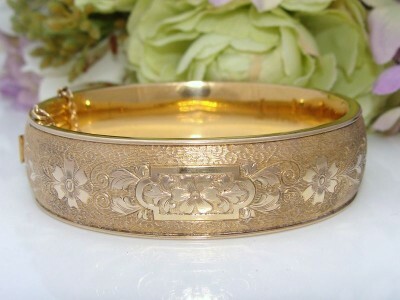 It is my pleasure to offer this Striking Antique Vintage Victorian Revival Bangle Bracelet. Although it is Vintage dating to around the 1940s, its design replicates those Antique designs popular some 40-50 years earlier. Each side is etched with a beautiful floral, foliate & geometrical design set amid a richly textured background which sets it off superbly and catches the light at every turn. The faces are superbly domed and the rib at the edge frames it superbly. The box & tongue clasp clicks closed securely and the hinge functions perfectly with a safety chain offering additional security. This bangle bracelet has a wonderful buttery yellow gold hue and that silky smooth feel usually only associated with solid carat gold. Maker: Bates & Bacon which was a business established in 1856, 156 years ago and operating until the early 1940s. They were the leaders in the market for a wide range of gold and gold filled such items and this is gold filled. Near Mint Antique Vintage condition! There are no dents, wear, repairs or damage – it is clear this has seldom if ever been worn. It is a beauty on the wrist and I am sure you’ll be thrilled. Perfect for Gift Giving or why not treat yourself to something special?